Kia ora and welcome to term 4! We have an exciting term of events planned and would love you to join in! The weather is (or will be!) heating up soon, please bring a sunhat every day in term 4 and spare clothes as water play, messy play and more outside fun in the sun will be happening! Please sun block your child/ren prior to them arriving into care in the morning and your educator will reapply as needed throughout the day. The Children’s Christmas party will be a fun filled event with Melanie Poppins, a bouncy castle, sausage sizzle and of course Santa himself! Hope you can all make it! Santa will have his sack filled with books for the children. If you are bringing siblings that are not enrolled with Organic Kids can you please provide a named, wrapped book for Santa’s sack. Flyer and map to come! With the Christmas holiday season fast approaching we would like you to start thinking of the Christmas leave you and your family intend to take over this time. 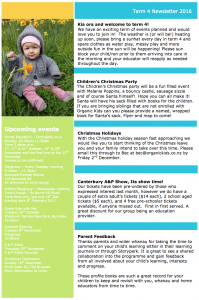 Please email this through to Bec at bec@organickids.co.nz by Friday 2nd December. Canterbury A&P Show, Its show time! Our tickets have been pre-ordered by those who expressed interest last month, however we do have a couple of extra adult’s tickets ($14 each), 2 school aged tickets ($5 each), and 4 free pre-schooler tickets available, if anyone missed out. First in first served. A great discount for our group being an education provider.